Schur estimated the comet’s brightness at around magnitude +6. What appears to be the dust tail extends to the lower right (southeast) with a narrower ion tail pointing north. With its twin tails, I’m reminded of a soaring eagle or perhaps a turkey vulture rocking back and forth on its wings. While they scavenge for food, Catalina soaks up sunlight. I also headed out before dawn for a look. After a failed attempt to spot the new visitor on Saturday, I headed down to the Lake Superior shoreline at 5:30 a.m. today and waited until the comet rose above the murk. Using 7×50 binoculars in a similar narrow observing window, I could barely detect it as a small, fuzzy spot 2.5° south of 4th magnitude Lambda Virginis at 5:50 a.m. 10 minutes after the start of astronomical twilight. The camera did better! With the comet climbing about 1° per day, seeing conditions and viewing time will continue to improve. The key to seeing it is finding a location with an unobstructed view to the southeast — that’s why I chose the lake — and getting out while it’s still dark to allow time to identify the star field and be ready when the comet rises to greet your gaze. There were side benefits to getting up early today. Three bright planets lit up Leo’s tail and Virgo’s “Cup” and a magnificent display of zodiacal light rose from the lake to encompass not only the comet but all the planets as well. Comet 67P/C-G may be tiny at just 2.5 miles (4 km) across, but its diverse landscapes and the processes that shape them astound. To say nature packs a lot into small packages is an understatement. In newly-released images taken by Rosetta’s high-resolution OSIRIS science camera, the comet almost seems alive. Sunlight glints off icy boulders and pancaking sinkholes blast geysers of dust into the surrounding coma. More than a hundred patches of water ice some 6 to 15 feet across (a few meters) dot the comet’s surface according to a new study just published in the journal Astronomy & Astrophysics. 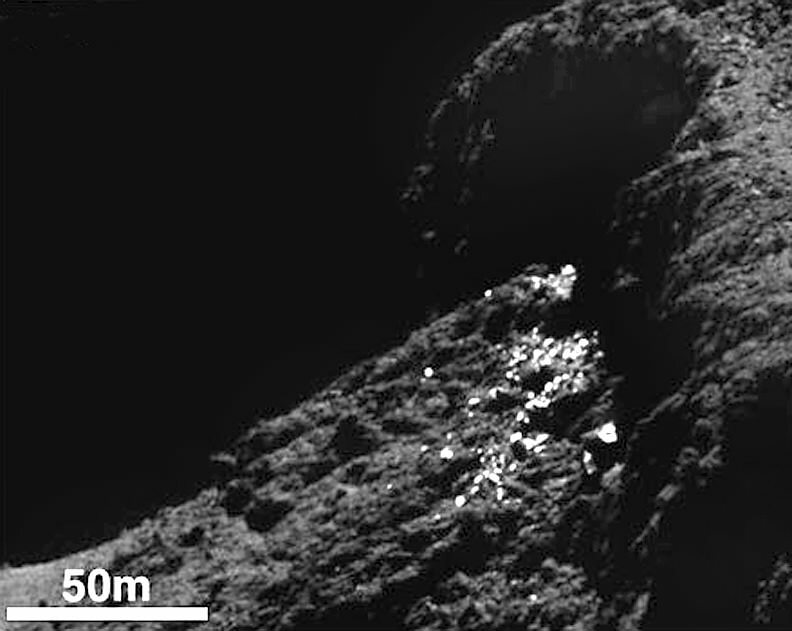 We’ve known from previous studies and measurements that comets are rich in ice. As they’re warmed by the Sun, ice vaporizes and carries away embedded dust particles that form the comet’s atmosphere or coma and give it a fuzzy appearance. Not all that fine powder leaves the comet. Some settles back to the surface, covering the ice and blackening the nucleus. This explains why all the comets we’ve seen up close are blacker than coal despite being made of material that’s as bright as snow. Scientists have identified 120 regions on the surface of Comet 67P/Churyumov-Gerasimenko that are up to ten times brighter than the average surface brightness. Some are individual boulders, while others form clusters of bright specks. Seen in high resolution, many appear to be boulders with exposures of ice on their surfaces; the clusters are often found at the base of overhanging cliffs and likely got there when cliff walls collapsed, sending an avalanche of icy rocks downhill and exposing fresh ice not covered by dark dust. More intriguing are the isolated boulders found here and there that appear to have no relation to the surrounding terrain. Scientists think they arrived George Jetson style when they were jetted from the comet’s surface by the explosive vaporization of ice only to later land in a new location. The comet’s exceedingly low gravity makes this possible. Let that image marinate in your mind for a moment. All the ice-glinting boulders seen thus far were found in shadowed regions not exposed to sunlight, and no changes were observed in their appearance over a month’s worth of observations. “Water ice is the most plausible explanation for the occurrence and properties of these features,” says Antoine Pommerol of the University of Bern and lead author of the study. How do we know it’s water ice and not CO2 or some other form of ice? Easy. When the observations were made, water ice would have been vaporizing at the rate of 1 mm per hour of solar illumination. By contrast, carbon monoxide or carbon dioxide ice, which have much lower freezing points, would have rapidly sublimated in sunlight. Water ice vaporizes much more slowly in comparison. Lab tests using ice mixed with different minerals under simulated sunlight revealed that it only took a few hours of sublimation to produce a dust layer only a few millimeters thick. But it was enough to conceal any sign of ice. They also found that small chunks of dust would sometimes break away to expose fresh ice beneath. “A 1 mm thick layer of dark dust is sufficient to hide the layers below from optical instruments,” confirms Holger Sierks, OSIRIS principal investigator at the Max Planck Institute for Solar System Research. It appears then that Comet 67P’s surface is mostly covered in dark dust with small exposures of fresh ice resulting from changes in the landscape like crumbling cliffs and boulder-tossing from jet activity. As the comet approaches perihelion, some of that ice will become exposed to sunlight while new patches may appear. You, me and the Rosetta team can’t wait to see the changes. Ever wonder how a comet gets its jets? In another new study appearing in the science journal Nature, a team of researchers report that 18 active pits or sinkholes have been identified in the comet’s northern hemisphere. These roughly circular holes appear to be the source of the elegant jets like those seen in the photo above. The pits range in size from around 100 to 1,000 feet (30-100 meters) across with depths up to 690 feet (210 meters). For the first time ever, individual jets can be traced back to specific pits. In specially processed photos, material can be seen streaming from inside pit walls like snow blasting from a snowmaking machine. Incredible! “We see jets arising from the fractured areas of the walls inside the pits. These fractures mean that volatiles trapped under the surface can be warmed more easily and subsequently escape into space,” said Jean-Baptiste Vincent from the Max Planck Institute for Solar System Research, lead author of the study. Similar to the way sinkholes form on Earth, scientists believe pits form when the ceiling of a subsurface cavity becomes too thin to support its own weight. With nothing below to hold it place, it collapses, exposing fresh ice below which quickly vaporizes. Exiting the hole, it forms a collimated jet of dust and gas. Pits Ma’at 1, 2 and 3 show differences in appearance that may reflect their history of activity. While pits 1 and 2 are active, no activity has been observed from pit 3. The young, active pits are very steep-sided; pits without any observed activity are shallower and seem to be filled with dust. Middle-aged pits tend to have boulders on their floors from mass-wasting of the sides. * The comet may contain voids that have been there since its formation. Collapse could be triggered by either vaporizing ice or seismic shaking when boulders ejected elsewhere on the comet land back on the surface. * Direct sublimation of pockets of volatile (more easily vaporized) ices like carbon dioxide and carbon monoxide below the surface as sunlight warms the dark surface dust, transferring heat below. * Energy liberated by water ice changing its physical state from amorphous to its normal crystalline form and stimulating the sublimation of the surrounding more volatile carbon dioxide and carbon monoxide ices. The researchers think they can use the appearance of the sinkholes to age-date different parts of the comet’s surface — the more pits there are in a region, the younger and less processed the surface there is. They point to 67P/C-G’s southern hemisphere which receives more energy from the Sun than the north and at least for now, shows no pit structures. The most active pits have steep sides, while the least show softened contours and are filled with dust. It’s even possible that a partial collapse might be the cause of the occasional outbursts when a comet suddenly brightens and enlarges as seen from Earth. Rosetta observed just such an outburst this past April. And these holes can really kick out the dust! It’s estimated a typical full pit collapse releases a billion kilograms of material. With Rosetta in great health and perihelion yet to come, great things lie ahead. Maybe we’ll witness a new sinkhole collapse, an icy avalanche or even levitating boulders! Tell me this montage shouldn’t be hanging in the Lourve Museum. Every time I think I’ve seen the “best image” of Rosetta’s comet, another one takes its place. Or in this case four! When you and I look at a comet in our telescopes or binoculars, we’re seeing mostly the coma, the bright, fluffy head of the comet composed of dust and gas ejected by the tiny, completely invisible, icy nucleus. As we examine this beautiful set of photos, we’re privileged to see the individual fountains of gas and dust that leave the comet to create the coma. Much of the outgassing comes from the narrow neck region between the two lobes. All were taken between February 25-27 at distances around 50-62 miles (80 to 100 km) from the center of Comet 67P/Churyumov-Gerasimenko. Looking more closely, the comet nucleus appears to be “glowing” with a thin layer of dust and gas suspended above the surface. In the lower left Feb. 27 image, a prominent streak is visible. While this might be a cosmic ray zap, its texture hints that it could also be a dust particle captured during the time exposure. Because it moved a significant distance across the frame, the possible comet chunk may be relatively close to the spacecraft. Just a hunch. While most of Rosetta’s NAVCAM images are taken for navigation purposes, these images were obtained to provide context in support of observations performed at the same time with the Alice ultraviolet (UV) imaging spectrograph on Rosetta. Observing in ultraviolet light, Alice determines the composition of material in coma, the nucleus and where they interface. Alice will also monitor the production rates of familiar molecules like H2O, CO (carbon monoxide) and CO2 as they leave the nucleus and enter 67P’s coma and tail. That and dust. In fact, 67P is giving off about twice as much dust as gas. 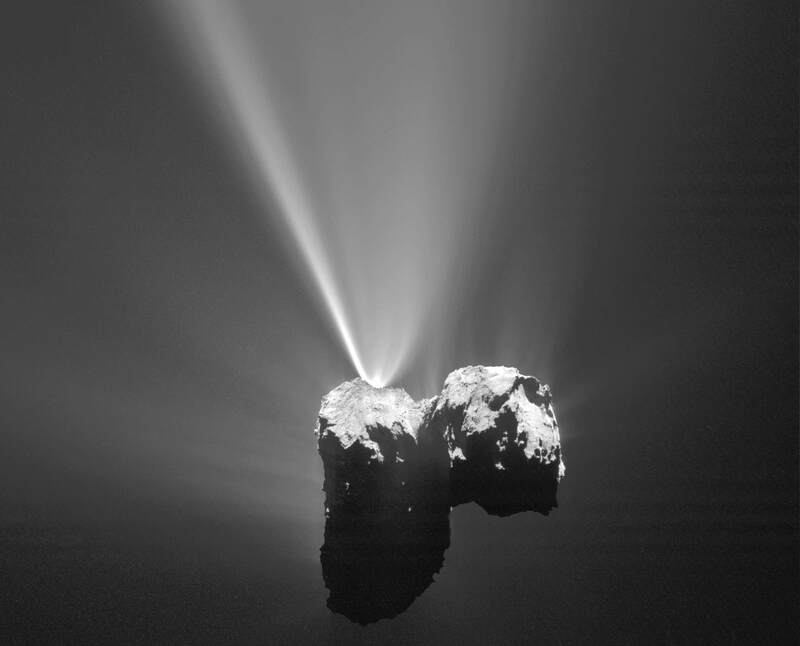 We see the comet’s dual emissions by reflected sunlight, but because there’s so much less material in the jets than what makes up the nucleus, they’re fainter and require longer exposures and special processing to bring out without seriously overexposing the comet’s core. 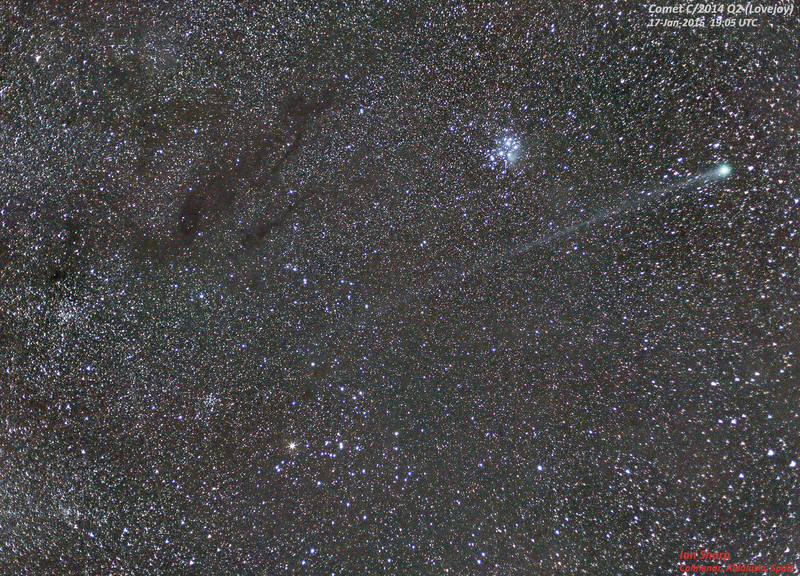 67P’s coma will only grow thicker and more intense as it approaches perihelion on August 13. First off: no, comet 67P/Churyumov-Gerasimenko is not about to explode or disintegrate. But as it steadily gets nearer to the Sun the comet’s jets are getting more and more active and they’re putting on quite a show for the orbiting Rosetta spacecraft! Click the image for a jeterrific hi-res version. These dramatic views are just a hint at what’s in store; 67P’s activity will only be increasing in the coming weeks and months and, this weekend, Rosetta will be swooping down for an extreme close pass over its surface! This Saturday, Feb. 14, Rosetta will be performing a very close pass of the comet’s nucleus, soaring over the Imhotep region at an altitude of only 6 km (3.7 miles) at 12:41 UTC. This will allow the spacecraft to closely image the comet’s surface, as well as investigate the behavior of its jets and how they interact with its developing coma. “The upcoming close flyby will allow unique scientific observations, providing us with high-resolution measurements of the surface over a range of wavelengths and giving us the opportunity to sample – taste or sniff – the very innermost parts of the comet’s atmosphere,” said Rosetta project scientist Matt Taylor. Read more about Rosetta’s Valentine’s Day close pass here and watch an animation of how it will be executed below. UPDATE: Here’s an image of 67P captured by Rosetta on Feb. 6 from a distance of 124 km (77 miles) as it moved into a higher orbit in preparation of its upcoming close pass. It’s the first single-frame image of the comet since leaving bound orbits. The image has been processed to add a contrasting tint and enhance jet activity. See the original image here. Single-frame NavCam image of comet 67P/C-G imaged on Feb. 6, 2015. Credits: ESA/Rosetta/NAVCAM – CC BY-SA IGO 3.0. Edited by Jason Major.